NSIC UP Recruitment 2019 National Small industries Corporation Ltd., (NSIC), an ISO 9001 certified company, has been working to promote aid and foster the growth of micro and small enterprises since its establishment in 1955. National Small industries Corporation Ltd., (NSIC), has seven technical support services are being rendered to MSMEs. These centers are located at New Delhi, Rajkot, Chennai, Howrah, Hyderabad, Aligarh and Rajpura. NSIC Course List 2019: AUTO CAD, MATLAB, 3D MAX, Python, PHP, Business Accounting with Tally ERP, Digital Marketing and Machine Operator, Big Data, Hadoop, o Level. 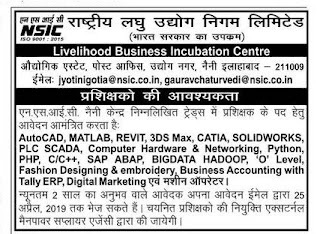 NSIC Jobs 2019: NSIC invited various number candidates to become trainer jobs in various computer, iti course runs by NSIC. NSIC will kept all those candidates for 2 years later on they will be transfer to another centers if he/she wants to improve their skill and continue their jobs. Selection Process: Reference is invited to notice dated 15 April with respect to the list of candidates will be shortlisted according to their trade. How to apply: Interested and Eligible candidates must send their application form through email address given in advertisement.